A strange and wonderful mix of history, romance, myth and legend. Short-listed for the 2018 Women's Prize for Fiction. In 1780s London, a prosperous merchant finds his quiet life upended when he unexpectedly receives a most unusual creature—and meets a most extraordinary woman—in this much-lauded, atmospheric debut that examines our capacity for wonder, obsession, and desire with all the magnetism, originality, and literary magic of The Essex Serpent. One September evening in 1785, Jonah Hancock hears an urgent knocking on his front door near the docks of London. The captain of one of Jonah’s trading vessels is waiting eagerly on the front step, bearing shocking news. On a voyage to the Far East, he sold the Jonah’s ship for something rare and far more precious: a mermaid. Jonah is stunned—the object the captain presents him is brown and wizened, as small as an infant, with vicious teeth and claws, and a torso that ends in the tail of a fish. It is also dead. As gossip spreads through the docks, coffee shops, parlors and brothels, all of London is curious to see this marvel in Jonah Hancock’s possession. Thrust from his ordinary existence, somber Jonah finds himself moving from the city’s seedy underbelly to the finest drawing rooms of high society. At an opulent party, he makes the acquaintance of the coquettish Angelica Neal, the most desirable woman he has ever laid eyes on—and a shrewd courtesan of great accomplishment. This meeting sparks a perilous liaison that steers both their lives onto a dangerous new course as they come to realize that priceless things often come at the greatest cost. 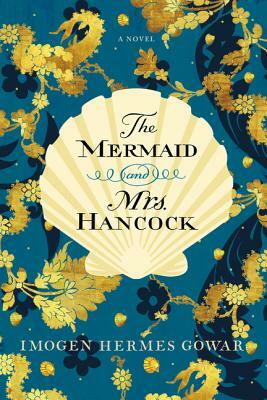 Imogen Hermes Gowar, Britain’s most-heralded new literary talent, makes her debut with this spellbinding novel of a merchant, a mermaid, and a madam—an unforgettable confection that explores obsession, wonder, and the deepest desires of the heart with bawdy wit, intrigue, and a touch of magic. Imogen Hermes Gowar studied Archaeology, Anthropology and Art History at UEA’s Sainsbury Centre for Visual Arts before going on to work in museums. She began to write small pieces of fiction inspired by the artefacts she worked with and around, and in 2013 won the Malcolm Bradbury Memorial Scholarship to study for an MA in Creative Writing at UEA. She won the Curtis Brown Prize for her dissertation, which grew into a novel titled The Mermaid and Mrs Hancock. An early draft was a finalist in the MsLexia First Novel Competition 2015, and it was also one of three entries shortlisted for the inaugural Deborah Rogers Foundation Writers’ Award.